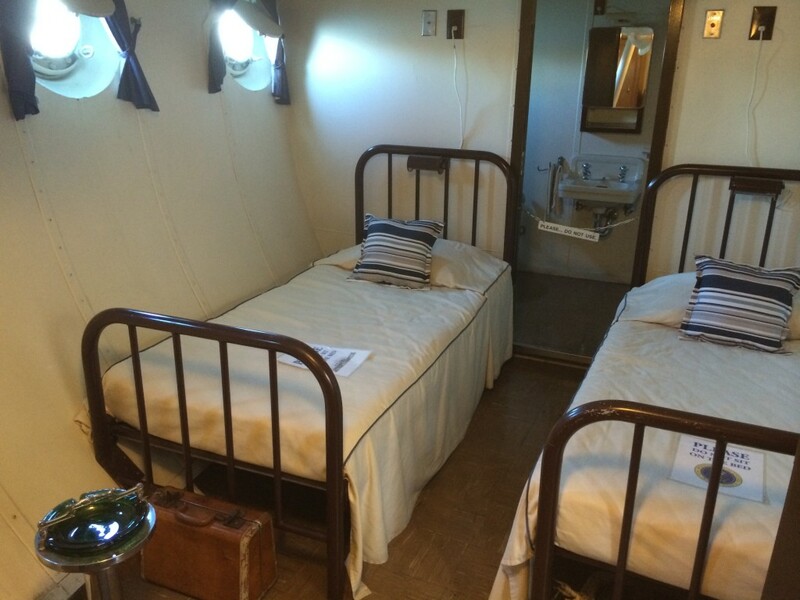 Experience History Aboard the USS Potomac in Jack London Square - Get on Board! This blog post was first published in November 2015 in honor of Veterans Day. 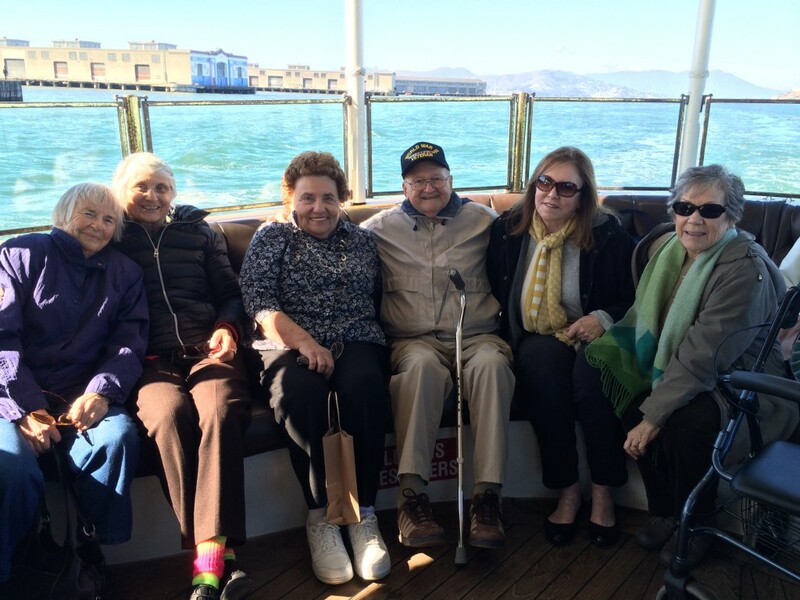 World War II veteran, Don Güt, and his companions from the Widowed Persons Social Club of Elk Grove snagged the premier spot aboard Franklin D. Roosevelt’s presidential yacht, the USS Potomac, for the annual November 11 Veterans Day cruise on the San Francisco Bay. 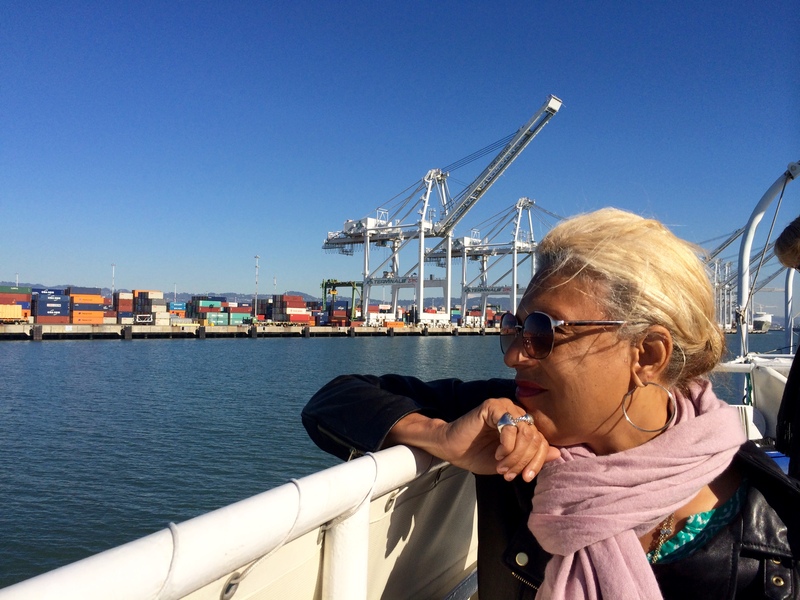 The group started out their day from the Sacramento Station and rode the Capitol Corridor to Jack London Square in Oakland, where the Potomac has been docked and open to visitors since 1995. Don Güt and his companions enjoy premier seating in the “fantail” section of the former presidential yacht. Mr. Güt, a former torpedo man in the Navy, was one of about two dozen veterans who took to the water on the pleasant, cloudless Wednesday for the 2-1/2 hour cruise hosted by the Association for the Preservation of the Presidential Yacht Potomac. The non-profit, 501(c)(3) organization owns and operates the Potomac as an active memorial to FDR and the momentous times through which he led our nation. 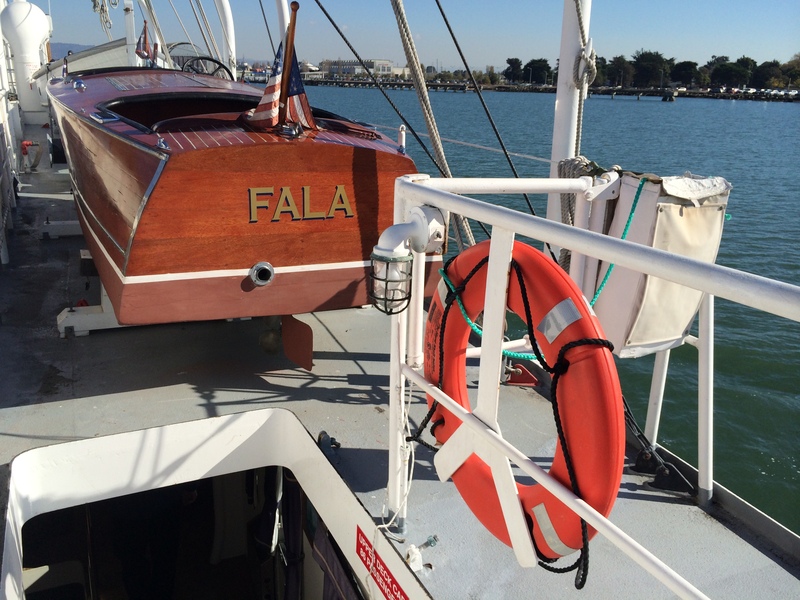 The Veterans Day Cruise is just one of many special events and sightseeing cruises available between May and November on the Potomac, which was originally built in 1934 as the Coast Guard cutter Electra. Visitors can also participate in docent-led dockside tours year-round on Wednesdays, Fridays, and Sundays between 11am and 3pm, or charter the boat, dockside or on the bay, for private events. 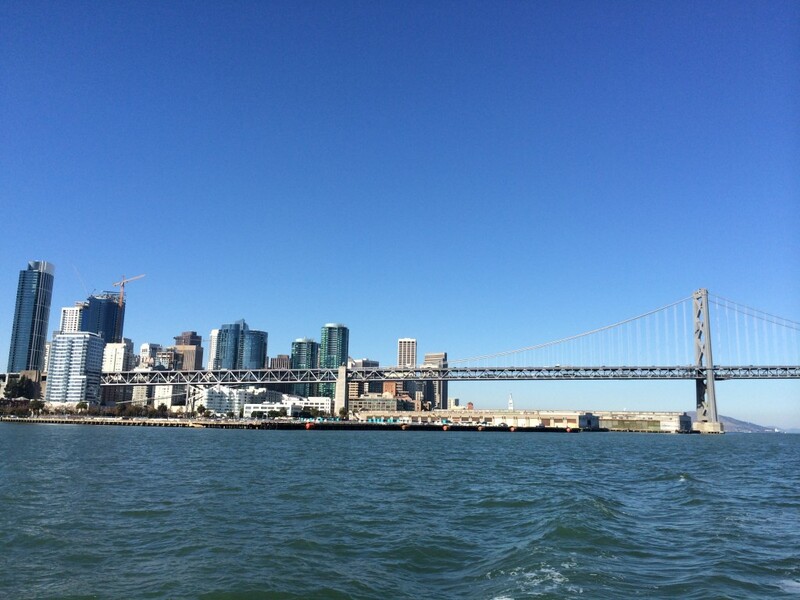 A cruise on the Potomac is one of the most pleasant ways to enjoy the San Francisco Bay. 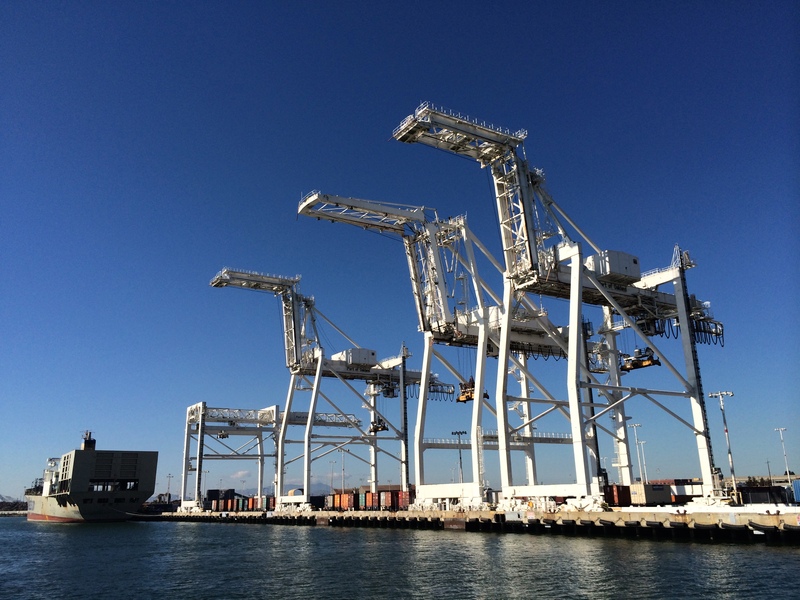 As the Potomac pulled out of the Oakland Estuary, blaring what is apparently the loudest horn on the Bay, many of the 119 passengers congregated on the top deck to get a good look at the Port of Oakland’s space-age cranes and the stacks of colorful shipping containers. After passing under the Bay Bridge, the Potomac continued into the heart of the Bay. We sailed past Treasure Island and Pier 39, and alongside the WWII-built SS Jeremiah O’Brien docked at Pier 45 in San Francisco. Returning to Jack London Square, we were able to navigate within close proximity to the aircraft carrier USS Hornet docked at Alameda Point. View of the Bay Bridge and San Francisco from the Potomac. The Potomac makes it way from the Oakland estuary into the San Francisco Bay. It was in 1936 that the Potomac was converted from the Coast Guard cutter to the presidential yacht, allowing FDR to get away from the formalities of the White House, and, according to a docent, the White House chef whose meals didn’t exactly appeal to the 32nd president. FDR was himself an excellent sailor and a former Assistant Secretary of the Navy. His deep love of the sea and naval tradition are reflected throughout the beautifully restored ship. 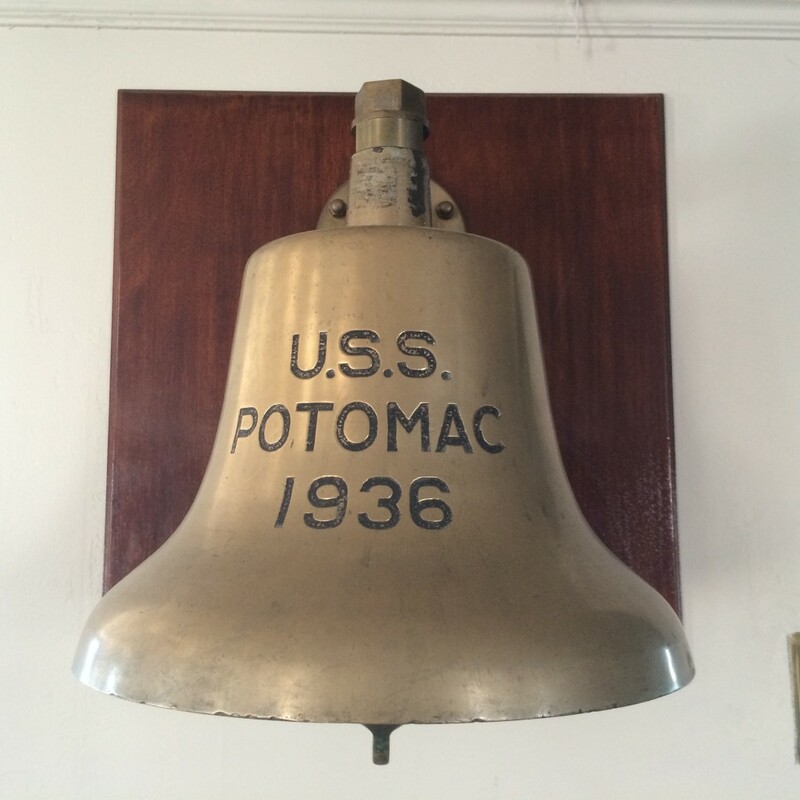 With rooms carefully refurbished to depict their original décor as much as possible – including FDR’s small, modest stateroom, the wood-paneled wheelhouse, and the radio room from which the president addressed the American people during a fireside chat in 1941 – the Potomac is as much museum as leisure sailing vessel. 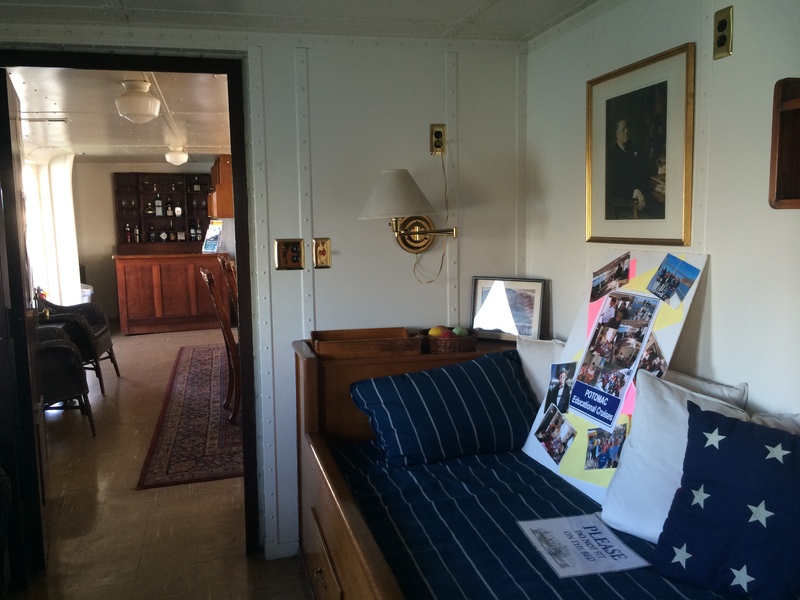 FDR’s narrow and modestly-decorated stateroom. A paraplegic since the age of 39, FDR’s greatest fear was being caught in a fire and unable to escape, so he chose the Potomac for its steel versus wood construction. A hand-operated elevator was installed inside a false stack on the ship so the president could use ropes and pulleys to move the elevator up and down between the saloon and upper boat deck. Aboard the Potomac, FDR met with administration officials, cabinet members, foreign dignitaries, advisers, friends, and family as he worked through the problems of the Great Depression and the brewing international conflict. During a visit to the U.S. by England’s King George VI and Queen Elizabeth – the first to the U.S. by a reigning British monarch – the royal couple joined FDR and Eleanor for a cruise down the Potomac River to Washington’s home at Mt. Vernon. Other royal visitors on the Potomac included Crown Prince Olaf and Crown Princess Martha of Norway, Prince Frederick and Crown Princess Ingrid of Denmark, Queen Wilhelmina of the Netherlands, and Crown Prince Gustav of Sweden. The guest room where King George VI and Queen Elizabeth stayed on their visit. When the U.S. entered WWII, FDR stopped using the Potomac regularly due to the increased pressures of leading the nation and growing concerns for his security. After FDR’s death in April 1945, the boat was decommissioned, and her story entered a far less romantic chapter. Briefly returned to the Coast Guard, the Potomac spent about 10 years in Maryland before becoming a private ferry between Puerto Rico and the Virgin Islands. Later, when she was about to be junked, rock star Elvis Presley gave her another lease on life by buying and donating the boat to St. Jude Children’s Hospital. The Potomac’s later adventures included an attempt to turn her into a floating disco and being seized by the DEA for drug running in 1980. In a sorry state of neglect, she was impounded at Treasure Island in San Francisco and sank there a year later before being raised and sold at auction to the Port of Oakland, the only bidder, for a mere $15,000. Spearheaded by the Port, the Potomac was preserved and restored in a 14-year, $5 million cooperative effort by FDR’s son, organized labor, maritime corporations, and volunteers. 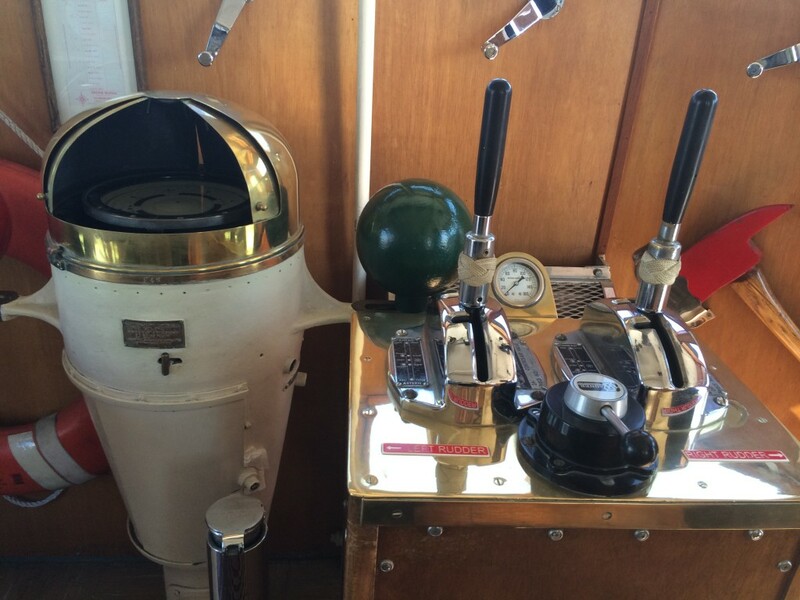 Today, the Association for the Preservation of the Presidential Yacht Potomac relies on donations, ticket sales, and grants to fund the yacht’s ongoing management and operation. The yacht is maintained by the non-profit organization’s small staff and almost a hundred dedicated volunteers like Mike Torrey, a former stockbroker who works every Monday on the yacht, using his wood crafting talent to restore the railings on the main deck and the paneling on the wheelhouse. Mr. Torrey was also volunteering on the day of the cruise, entertaining questions and sharing stories about the Potomac. The wood-paneled wheelhouse on the Potomac features more original material than any other room on the boat. Docked in Jack London Square near the Port of Oakland, the Potomac is a short and scenic stroll from the Jack London Square Capitol Corridor Station. Jack London Square boasts a wide variety of excellent waterside restaurants (and a Ben & Jerry’s Ice Cream), so visitors can turn their visit to the “Floating White House” into a full-day excursion that begins and ends with a relaxing train ride.